Orson DeForest Butler was born in Sheldon, Franklin County, Vermont on September 12, 1839. His parents were Benjamin Butler (1796-1887) and Mary Ainsworth Butler (born 1801), who married in about 1818. The Butler family history and genealogy have been extensively researched by A. Faulkner, old_buck_house@msn.com (and many thanks to Ms. Faulkner for her gracious input to this biographical sketch; information beyond that of the military records comes from her). Before and after their migration to the United States, the Butlers were primarily a seafaring family engaged in shipping and whaling. The first of the Butler's lineage in this country arrived in 1636 from England and settled finally in Martha's Vineyard. With the Fifty-First Illinois. At age 24, in January 1862, Orson enrolled in Captain Ezra Brainard's Company D of the Fifty-First Illinois. Orson was quickly promoted through the non-commissioned ranks to company sergeant. Already, in July 1862, when the regiment was in camp at Corinth, Mississippi, Butler was "acting Lieutenant" of Company D: Brainard resigned that month and returned home to Chicago, and other officers of the company were on temporary recruiting service back in Illinois. Butler came through the railroad guard of August to October 1862, the forced march and skirmishing around Nashville in November and December 1862, and the Battle of Stones River in 1862 (December 31) unscathed. He was formally commissioned second lieutenant on June 12, 1863. Butler's luck held and he was not wounded either at Chickamauga or at Missionary Ridge. Marriage to Margaret L. Taylor. Butler married Margaret Louisa Taylor on March 10, 1864 in Woodford County, Illinois at the time the Fifty-First Illinois returned to Illinois on a 30-day re-enlistment furlough. Capture at the Battle of Franklin. In May, with that brief Spring vacation in Illinois quite over, the Fifty-First Illinois embarked on the Georgia campaign under the generalship of William T. Sherman. On June 27, 1864 Sherman ordered a foolhardy attack on the Confederate positions at Kennesaw Mountain. The regiment suffered heavy casualties, among them officers of Company D, Theodore Brown and Thomas Cummings. From that date on, Butler was in command of the company. But Butler's string of good luck, too, broke. He was captured by Confederate forces at the Battle of Franklin on November 30, 1864. He spent the next three or four months imprisoned at Andersonville. In mid-March 1864, with the Confederacy collapsing in Georgia, Butler was moved to Vicksburg, Mississippi. He was paroled there on April 18, 1865. A few days later he arrived at Benton Barracks in Missouri. He was formally discharged on May 15, 1865. After the War. Butler returned to Illinois. The 1870 census locates Orson and wife Margaret in McLean County, Illinois, farming. They had two children. In 1880, the family was still living McLean County; there were five children—and Orson's father, who had come west to Woodford County, was also resident in McLean County. In March 1882, Butler left Illinois and moved to rural Columbus, Platte County, Nebraska where he continued to farm. In 1896, Butler sold 240 acres of his farmland at $75.00/acre to Platte County. The 240 acres constituted the Platte County county farm. A few months later Butler contracted with Platte County to maintain the county farm. He rented the land which he had just sold back and received a weekly fee for the upkeep of each resident of the county farm. There was yet one more migration for Orson and Margaret. They moved, perhaps in retirement, to Yankee Hill, Nebraska, in Lancaster County, near Lincoln. Walter, one of Orson's sons, lived nearby. 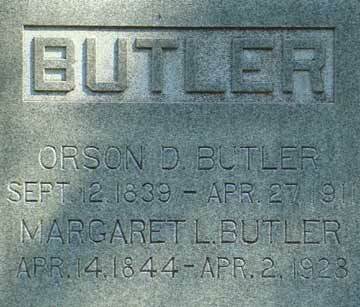 Butler died on April 27, 1911. 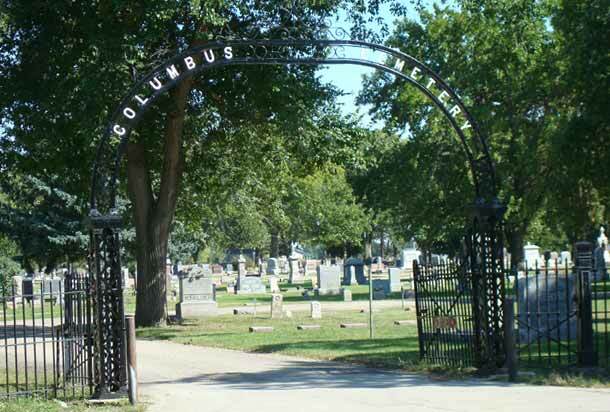 He is buried in Columbus Cemetery, Columbus, Nebraska. 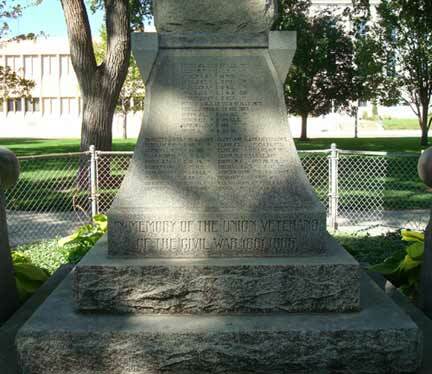 Each of the monument's four faces lists the names of Union veterans. 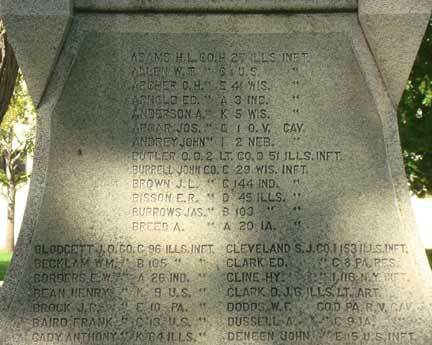 Butler is listed on the eighth line in the photo immediately above, "Butler O. D. 2 LT. CO.D 51 ILLS. INFT." A. Faulkner, Genealogist, Butler and Associated Families. Orson Butler, Compiled Service Record, Records of the Adjutant General's Office, 1780's-1917, Record Group 94, National Archives and Records Administration, Washington, D.C.
G. W. Phillips, ed. Past and Present of Platte County Nebraska: A Record of Settlement, Organization, Progress and Achievement. Two Volumes. Chicago: S. J. Clarke Publishing Company, 1915. United States of America, Bureau of the Census. Eighth Census of the United States, 1860, Washington, D.C.
United States of America, Bureau of the Census. Ninth Census of the United States, 1870, Washington, D.C.
United States of America, Bureau of the Census. Tenth Census of the United States, 1880, Washington, D.C.
United States of America, Bureau of the Census. Twelfth Census of the United States, 1900, Washington, D.C.
United States of America, Bureau of the Census. Thirteenth Census of the United States, 1910, Washington, D.C.